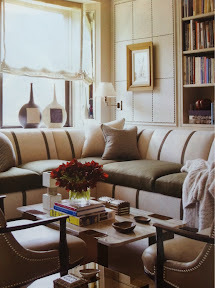 This image jumped out at me flipping through the pages of architectural digest this month. I love love love the switch up on the cushions on this custom couch. To have your seat in a solid and back with a stripe in a different color it really makes this room. Who says couches have to be one color? Liven up your sofa by adding trim or recovering back or front cushions in a pattern. It takes our blasé room hog to new heights without giving up the comfort we crave.